Jordan Rapana and Nick Cotric, joint winners of the 2017 Fans’ Choice Player of the Year. 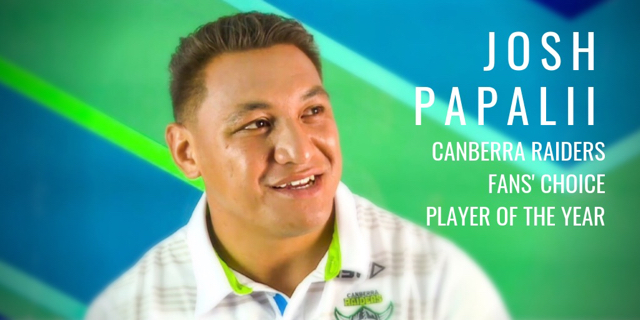 Josh Papalii is the winner of the Canberra Raiders Fans' Choice Award for 2018. The award was decided in the final round of the season, with Papalii taking man of the match honours in the clash with the Warriors - and overtaking Joe Tapine. It is the second time Papalii has won the Fans' Choice award, also finishing on top in 2016. As the Player of the Year, Papalii also takes out the Fans' Choice Award for Forward of the Year. Papalii started the season in indifferent form, and was relegated to the Raiders NSW Premiership affiliate, Mounties, in Round 5. He responded with a man of the match performance, clocking up an impressive 182 metres from 17 runs, 78 post contact metres, four tackle breaks and 21 tackles. He didn't play "reserve grade" again, playing 22 NRL matches for the season - and was named man of the match by the fans in six matches. He certainly did that. After returning to firsts, Papalii shifted from the edge to the middle and made the lock position his own. He played all three State of Origin matches for the Maroons, and put himself back into contention for Kangaroos selection. "I thought he had a really good series, I think he's having a really good year," Australian coach Mal Meninga said after the Origin series. "Certainly since he's been dropped, come back in the side and playing in the middle of the field at 13 he's excelled. I think he's one of the best forwards in the competition at the moment on form." "The good thing with 'Papa' is he's got flexibility. He can play edge, he can play middle. The middle suits him. He's a big unit, got good footwork, good speed, he's got a great motor, he can last good minutes." He finished the season as the Raiders' biggest metre eater in the forwards, averaging 126 metres from 14 runs and 27 tackles per game. He produced five tries and two try assists and also made 56 tackle breaks, seven line breaks and 14 offloads for the year. Papalii earned a four year contract extension with the club in June, tying him to the Green Machine until the end of 2022. He'll be aged 30 by the end of that deal, and it now seems likely he'll end his career as a one club man. Fellow back rowers Joe Tapine and Elliott Whitehead finished in second and third place in the voting. Tapine played just 16 games due to suspension and injury. He led the voting before breaking his thumb with two matches remaining in the season - so he's been very consistent when on field. Jordan Rapana and Jack Wighton are joint winners of the Back of the Year, finishing the season on 11 points. Wighton did not play after Round 15, suspended after he pleaded guilty to assault charges - his regrettable off field behaviour also costing his team dearly. Rapana was one of the joint winners of the Fans' Choice Award in 2017, but he only forced a tie in the last round, polling two points against the Warriors. The Canberra Raiders Fans' Choice Player of the Year has been awarded since 2004, with the inaugural winner being Ruben Wiki. Other winners have included Alan Tongue, Terry Campese, Shaun Fensom, Jarrod Croker, Josh Hodgson, Jordan Rapana and Nick Cotric. 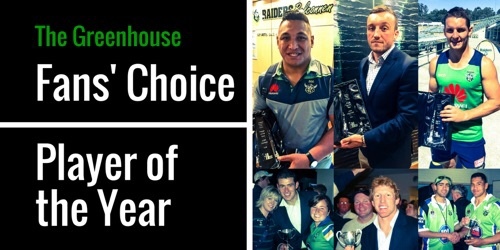 The award, sponsored by The Greenhouse Canberra Raiders supporters site (TheGH.com.au), is voted on by the fans on line, who give 3-2-1 points to the best players each week. The Player of the Year receives a crystal trophy from The Greenhouse.